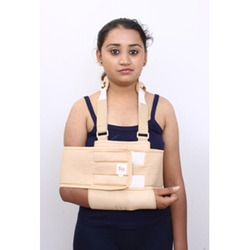 For the purpose of providing the finest Shoulder Immobilizer, we engage in using the finest raw materials and modern machines in its manufacture. Manufactured as per the set industrial norms and guidelines, it is of optimum quality. Owing to the high grade raw materials used in its manufacture, the product is highly effective and characterized by a longer lifespan. Material: Meshes fabric + woven strips. Looking for Shoulder Immobilizer ?